This year, 50,000 wildfires have burned 8.5 million acres of land in the United States. California, Washington, Oregon, and Montana currently have multiple large fires burning. The large Eagle Creek fire in the Columbia River Gorge near Portland was started by two teenagers who set off a firecracker. Fire ecologist Jennifer Balch conducted a study that showed that humans were responsible for starting 84 percent of wildfires. 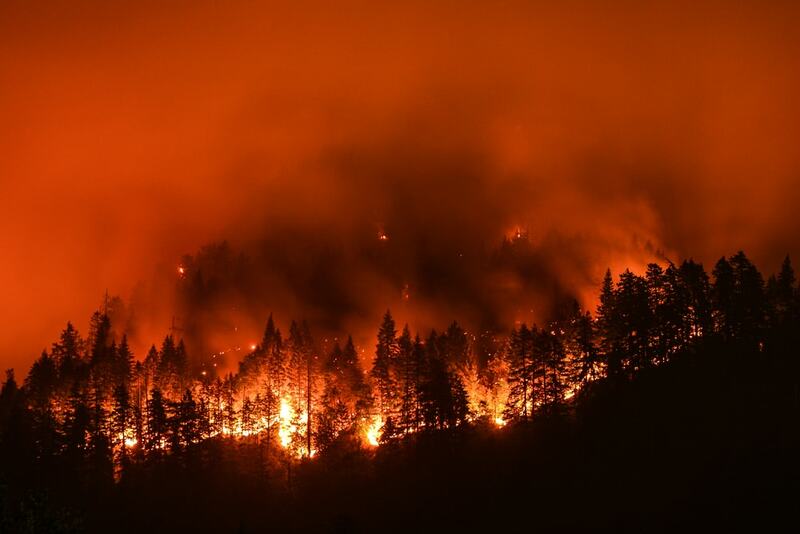 Balch and Hugh Safford, a fire ecologist with the Forest Service, discuss the role that human influence—including climate change—might have on future wildfire seasons, and how this will affect the ecosystems and management of wildfires. Additionally, atmospheric chemist Bob Yokelson describes the composition of the smoke plumes from these wildfires and the effects on air quality. Bob Yokelson is a professor of chemistry at the University of Montana. He’s based in Missoula, Montana. Jennifer Balch is the director of Earth Lab and an assistant professor of geography at the University of Colorado. She’s based in Boulder, Colorado. Hugh Safford is an adjunct professor in environmental science and policy at the University of California – Davis, and a regional ecologist with the Forest Service, Pacific Southwest Region. He’s based in Vallejo, California. IRA FLATOW: This is Science Friday. I’m Ira Flatow. While intense hurricanes have certainly captured our attention lately, the wildfire this season– well, a season as well– it’s a wild one. The West could certainly have used some of Hurricane Harvey’s intense rainfall. 8.5 million acres have burned. 38 large fires are still burning across the West. The Pacific Northwest, California, and Montana have been some of the hardest-hit areas. And it’s not just remote regions of forest that have been affected. Blankets of smoke have shrouded cities, and 33,000 acres of the Columbia River Gorge, about an hour outside of Portland, have been scorched. So what’s been fueling the fires this year? How much do humans contribute? Does climate change lead to bigger fires? And how will the forests and ecosystems rebound? Well, that’s what we’re going to be talking about this hour. Jennifer Balch, assistant professor of geography and director of the Earth Lab at the University of Colorado in Boulder is with us. Welcome to Science Friday. JENNIFER BALCH: Thank you for having me. IRA FLATOW: You’re welcome. Hugh Safford, a regional ecologist for the Forest Service Southwest Region. He’s based in Vallejo, California. Welcome to Science Friday. HUGH SAFFORD: Thanks for having me. IRA FLATOW: And we want to hear from you, our listeners, especially if you’re in a state with an active fire. There are 48 active fires going on, as I said, big ones. And the number, if you want to call in, is 844-724-8255, 844-SCI-TALK. And as always, you can also tweet us. We’re happy to take your tweets at the same time. Hugh, can you give us an idea about the area in northern California that’s been affected? What is the terrain like? How does that influence how these fires are burning? HUGH SAFFORD: Yeah, sure. So we’ve got two major areas of fires. One that’s continuing today is in northwestern California between the Oregon border and what we call the Mendocino National Forest. And there we’ve had– and mind you, this is still going on. We’re probably looking at another two to four weeks of burning. But we’re right now at about the third– most acres we’ve seen burned in that part of the state in the last 110 years. And then, in the Sierra Nevada, and in the Modoc Plateau in the Southern Cascades, they’ve had quite an active year as well. This is going to probably end up in the top 10. So it’s– they’re big years in both places. I don’t think that the intensity of the fires has been necessarily all that high, which is good news for us. But it’s been a big year, with a lot of smoke impacts, as you noted. IRA FLATOW: Yeah, and Jennifer, you’re in Colorado. What areas have been burnt to the north of you in Montana? JENNIFER BALCH: Yeah, so Montana has seen over a million acres of area burned so far this year. And they’re currently dealing with what’s likely one of their biggest fires in the last couple of decades. So they’ve had some significant fires this season. IRA FLATOW: And are they big and as intense as the ones in northern California? JENNIFER BALCH: So there’s been a high pressure zone that’s effectively prevented rainfall from happening, keeping areas really dry in Montana. There’s three states that have set records, in terms of how hot or dry it’s ever been on record. And that’s California, Oregon, and Montana. IRA FLATOW: Can we say anything about climate change playing a role in these wildfires? JENNIFER BALCH: Yeah. We’ve known for over a decade that there’s a strong link between a warmer climate and wildfires. And we know– we can even parse out that contribution and say that effectively, climate change and human-caused climate change has made fuels 50% drier, and it’s doubled the amount of Western forests that have burned since the 1980s. IRA FLATOW: And we’re tracking a very warm year, aren’t we? JENNIFER BALCH: We are. We’re currently in the midst of what’s tracking to be the third-warmest year on record. And last year, 2016, was the warmest year on record, since records started in the 1800s. IRA FLATOW: And specifically, the Pacific Northwest and Montana, they have tracked some of their warmest days, right, in the summer, have they not? JENNIFER BALCH: Exactly. So those three states– California, Oregon, and Montana– have all seen record-breaking hot or dry conditions in the summer months. IRA FLATOW: Hugh, California has that extended drought. But all you had– you had a wet winter, right? You would think that having more water in the system would help prevent the fires. HUGH SAFFORD: Yeah, well, you remember that in California, we have– we both enjoy and suffer the consequences of having a Mediterranean climate. And what that means is that, come about May or so, someone upstairs turns the switch off, and we might see rain again sometime September, October, not taking into account maybe periodic thundershowers at higher elevations. So we– Scott Stevens calls this the pyro state, and it’s a state in which we have the kind of drought that you only get in the Rockies every 100 or 200 years. And that happens every year here. So it’s a place in which the conditions are always right for burning, even when you have a really wet winter. So what’s happened is with a really, really wet winter, we’ve grown a lot of vegetation, a lot of fine fuels, in particular. And if we’d had a– I don’t know, [INAUDIBLE] an average summer, whatever that is in California, we might not have had quite as many ignitions and quite as many big fires. But as Jennifer noted, it’s been an extraordinarily hot summer, and with relatively little rainfall, but a lot of dry lightning. And the Klamath– and this is actually in northwestern California. This is certainly the pattern that we’ve seen over the last 30 to 35 years, is a lot of years with some burning, and then, in sort of episodes that might happen two to 12 years apart, we’ll get these outbreaks of lightning fires, that there’s so many of them that they just simply can’t be controlled. And in this case, that’s what happened. And you’re just looking at, basically, an inability to control them. And so we’ve been managing a lot of these for ecological benefit, but also because we don’t really have much choice. Just trying to protect what assets we can. IRA FLATOW: Jennifer, the Columbia Gorge fire in Oregon was started by teenagers throwing a firecracker. And you published this study that found humans started a surprising amount of wildfires. I’m looking at it, it says 84%? 84% started by people? JENNIFER BALCH: Yeah, it’s striking, isn’t it? Yeah, so over a couple of decades, we looked at over a million and a half records across the US, and found that 84% of our wildfires are actually started by people. And we effectively bring fire with us wherever we go. We use it for debris burning. It’s part of our campfires. It’s a consequence of fireworks. We toss cigarettes out and they catch vegetation on fire. There’s lots of different ways that we start fires. IRA FLATOW: So if climate change is extending, let’s say, the camping season for a week or two, that means people are bringing the fire with them and extending the fire season. JENNIFER BALCH: Yeah. It’s not only extending the camping season, it’s definitely extending the fire season. So we also know, the trends in the Western US are that it’s two degrees Fahrenheit warmer. Snowmelt happens about one to four weeks earlier. And the fire season length is three months longer than it was in the 1970s. And so that, coupled with the fact that people are also bringing along ignitions, and we’re dispersing those ignitions throughout the year. So lightning, which is the natural source of fires, tends to occur now. This is sort of the tail end of the lightning strike season. But what people are doing is we’re effectively creating a year-round fire season, where we’re coupling the ignition availability and the spark that starts those fires with a warmer, an extended fire season. IRA FLATOW: Wow. Wow. And Hugh, what’s the ecological impact of having these shifted, longer fire seasons? HUGH SAFFORD: Well, there’s a whole lot of them, actually. It’s interesting, because this year, almost all our big fires in California this year were caused by lightning. But particularly in Southern California, we’ve got a rampant human fire regime. I suspect probably well north of 90% of fires down there are caused by humans. But yeah, you just simply increase the amount of fire on the landscape. And what I’ll say is that the places that humans and lightning ignite fire are pretty different on the landscape. Humans are igniting fires usually on the peripheries of urban areas, along highways, very often in canyons. And particularly in a place like the Sierra Nevada, where we often have– most of the canyons are aligned with the general wind directions, so when people start fires at the bottom of canyons, they race very quickly up into wildlands, and they can become very difficult to contain. They also happen under the most extreme conditions, because that’s when we lose those kinds of fires. Right, if someone is– the one benefit of dealing with a fire set by a human is that most of the time, it’s being set relatively near to firefighting resources. IRA FLATOW: Interesting. One of the– I’m sorry. Go ahead. HUGH SAFFORD: That was just my point, in that when– you know, most lightning strikes are happening at higher elevations, often in areas with lesser fuels. They usually take quite a bit longer to get rolling into something that becomes a problem. IRA FLATOW: And one of the most remarkable aspects about the wildfires are the large amounts of smoke they’re putting out. Parts of the plume have even drifted over to Western Europe, I understand. So what is exactly in the smoke? My next guest, and a team of researchers, studied the smoke from wildfires in 2013. Their results were published this summer in the Journal of Geophysical Research: Atmospheres. Bob Yokelson is a professor of chemistry at the University of Montana in Missoula. Welcome to Science Friday. BOB YOKELSON: Hello. Thank you. IRA FLATOW: Why is so much smoke coming out of the fires this year? BOB YOKELSON: Well, I think the previous speakers covered this pretty well. In the Pacific Northwest, it was either the hottest and driest summer, or one of the hottest and driest summers on record in much of the area. And this is something that may worsen with climate change. And then we also have the years of aggressive fire suppression that allowed abnormal amounts of fuels to build up in large areas. And then there’s also just practical considerations. We have some good ideas that we’ve had for a while, how to improve the fire situation. But they cost money, and that’s hard to get. IRA FLATOW: Ah, money. 1-844-724-8255. 844-724-8255 is our number, if you’re experiencing that smoke or a fire in your neighborhood. Or you can tweet us @SciFri. And let’s talk about that smoke, Bob. You looked at the fires from 2013. What are the plumes of smoke made out of? What’s in them? BOB YOKELSON: So most of what’s in smoke, you can’t actually see. About 90% of the vegetation, or fuel, is converted to CO2. And next most abundant is CO, carbon monoxide. And that’s also invisible. The rest of the smoke is divided up into hundreds of relatively minor gases. And then the part that you can see is the few percent that’s super-small solid particles or liquid droplets. And you’ll hear those referred to as aerosol particles, or particulate matter. And by super-small, we mean that they’re less than a thousandth of an inch in diameter. And that’s so small that their gravity is minor, and they can stay suspended in the atmosphere for weeks. And that’s also what reflects sunlight. That’s why you can see it and they can clog your airways. So that’s sort of a quick summary of what’s in smoke. IRA FLATOW: So it says, those tiny pieces of soot, is that what they would be, that tiny particulate soot? BOB YOKELSON: Right. Some of it is soot, like you would see come out of a diesel truck, like a black chain of soot. But some of it is liquid droplets of organic material too. IRA FLATOW: OK. Some tweets coming in from Peter. It says, “When I hike in the Sierra Nevada, I see huge numbers of dead trees. This seems to foretell more severe fires and ecosystem changes.” Is there a lot of wood just lying down, possibly from beetles eating up the trees, and they’re going to be there waiting for another fire? BOB YOKELSON: So is this a question for me? BOB YOKELSON: So I think that when the trees first die, they have– the needles turn red. And you have a temporary large increase in the fire danger because of that. But once the needles fall off, and you have large dead snags standing, that doesn’t contribute too much to the fire danger. On a very dry summer, it will contribute to the fuel load, but not to the real possibility of fires getting out of control initially. IRA FLATOW: I’m Ira Flatow. This is Science Friday from PRI, Public Radio International, talking about the wildfires in the West. Hugh, you know something about those beetles and trees. HUGH SAFFORD: Yeah, we got our comeuppance recently. Followed up on the large mortality events they had in the Rockies and in British Columbia. The difference in California is that these have happened in forests that historically had very frequent fire, that used to burn mostly at sort of low to moderate severity, in terms of its effects. And it’s kind of a different suite of species that we’re dealing with down here as well. So it’s been kind of an interesting question. It was a great answer just given to the impact of dead trees on fire behavior, and that’s exactly right. And I think what we’re principally concerned with, the first about one to four years after fire, because of the increase in the fine fuel load in the canopy. And in the last couple years, we’ve had some quite large and quite severe fires in that system that’s seen so much mortality. I think that the estimate by Forest Service for self-protection end of last year was that something on the order of 110 million trees had died around California as a result of the drought. And we are seeing large and very difficult to control fires in those systems now. IRA FLATOW: Bob, should we be concerned about the human health, about ourself, when it comes to this smoke? BOB YOKELSON: Well, yes. You know, all combustion sources– fires, cars, factories, et cetera– are known to produce particles that are known to expose the public to levels of particles that do cause lung, heart, and other issues. The gases emitted by combustion, as far as we know, don’t usually cause exposures that exceed safe levels. But we have to be careful there, because we don’t know everything about the combined effects of pollutants here. IRA FLATOW: So you have different types of fires that cause different types of smoke? BOB YOKELSON: Well, most of the smoke, most of the constituents of smoke are similar from between different fires, with, you know, there’s an average value and some variation. And different fire types have that same average value. But one thing that stood out when we studied wildfires was that a much greater percentage of the smoke was composed of the particles. IRA FLATOW: That’s compared to the controlled fires, you’re saying? BOB YOKELSON: Right. So in 2009 through 2011, various government agencies that conduct prescribed burns funded us to measure what was in the smoke from those prescribed burns. And we didn’t have data yet on wildfires at that time. And when we looked at the data that we got in 2013 for wildfires, as I said, a lot of the composition data was the same. But one major difference stood out. And that was that the wildfires produce about two or three times more smoke particles per pound of fuel burned than the prescribed fires. And we already knew that wildfires consume about three times more pounds of fuel per acre. So if you put those numbers together, you’re coming up with about 10 times more smoke particles per acre. And so that’s important because it adjusts our thinking about where the pollution is coming from. But it also suggests that we could go into some of these forested areas that are going to burn sooner or later, and if we burn them at the time of our choosing, to make less smoke, and smoke that’s directed away from more people, that this could be a beneficial thing. But it has to be recognized that some areas will require mechanical fuels reduction before prescribed burning is safe. IRA FLATOW: Interesting. Thank you, Dr. Yokelson, for taking time to be with us today. Bob Yokelson, professor of chemistry, University of Montana in Missoula. We’re going to take a break, and after the break, we’re going to come back and talk more about wildfires in the West. We welcome your calls, 844-724-8255. You can also tweet us @SciFri. Lots of folks are tweeting. We’ll see if we can get to those tweets when we come back. Stay with us. We’ll be right back after the break. This is Science Friday. I’m Ira Flatow. We’re talking this hour about the wildfires that have burnt over 8 million acres this year, and what it means for future fires. My guests are Jennifer Balch, associate professor of geography, director of the Earth Lab at the University of Colorado in Boulder. Hugh Safford, regional ecologist for the Forest Service’s Southwest Region. He’s based in Vallejo, California. And our number, 844-724-8255. Let’s talk about, you know, for decades, Hugh, the approach to these wildfires has been 100% suppression. If there’s a fire, you put it out. And we now know we need to rethink this approach. Right? How has the management end of how we put out fires changed? HUGH SAFFORD: It’s really changed quite a bit, actually. And that’s, I think, one of the real positive outcomes of a lot of the science and a lot of the thinking that’s gone on in management circles. Yeah, until the early ’70s, we operated under this famous 10:00 AM rule, where a district ranger or a forest supervisor was expected to get a fire out by 10:00 AM the next morning. And we’re now in a situation with warming climates that all the fuel that’s sitting on the ground in a lot of these forest types is really becoming problematic, in terms of not just the fact that it’s causing fires, but the kind of effects that we’re having. And so in managing fires, there’s– I don’t know the right way to put it, but a much more, I’ll say, progressive attitude in which fires now don’t have to be declared simply as good or bad from the very beginning and then treated as such, but rather different portions of a fire can be treated as good things or bad things. And what we know is that given that the lack of low-severity, sort of beneficial-effect fire in a lot of western forests is a major issue, we want to foment that wherever we can. And most wildfires will burn a large proportion of their area in that kind of way. And we’re in a situation now where that kind of burning can actually be encouraged. It’s usually called sort of a confine-and-contain process, where you might build a box in a landscape around the fire and say, if we can keep it in here and if we like the effects, we’ll just monitor this thing. But when it becomes a problem elsewhere, they can jump on it. IRA FLATOW: Let’s go to the phones. Let’s go to Wesley in Kansas City. Hi. Welcome to Science Friday. WESLEY: Hey, Ira. Thanks for taking my call. I’m actually from the Bay Area. And I was just wondering if we could take a proactive approach to this. For example, before the [INAUDIBLE] earthquake, my parents spent about $4,000 outfitting the house based on the foundation. And after the quake, we had no damage. I was just wondering, is it possible that the homeowners could do a similar measure by maybe cutting the trees around their homes, in the fire danger area, to prevent fires? IRA FLATOW: Good question. Let me get an answer from Jennifer. JENNIFER BALCH: Yeah, there’s definitely ways we can build better. The way that we construct houses and landscapes, the materials that we use for them, there’s lots of things that we can do to improve how fire-safe communities are and can be. IRA FLATOW: It seems like, you know, we have– I mentioned at the beginning of the show, we were talking about the hurricanes and the flooding that was going on in the East, and then people were living in areas and on floodplains in some of these cases. And people now are choosing to live where fires happen, right? JENNIFER BALCH: It would be wonderful if we had fire escape maps the way that we consider floodplain maps, in terms of incentivizing where people live, because we’ve effectively tried the experiment of removing fire from the landscape, and it didn’t work, because we do live in flammable places, especially in Western ecosystems that are dependent on fire. 9% of what’s called the wildland-urban interface, where houses intermix with wild areas, is developed. And it’s where people are living. And that’s projected to double by 2030. So we really do have to think about building better into these landscapes, and living more sustainably with fire. So people– you can’t avoid the smoke, noticing the smoke, right? You start to cough and it’s bad for your health. HUGH SAFFORD: Yeah. This is Hugh. I’ll answer that. And the answer is that that can be part of the solution in some of the ecosystems that we’re talking about. And really, I think we’re at a point, and I think Bob put it really well, and then Jennifer, I think, referred to this as well, is that we’re kind of in a situation now where after 100 years of allowing fuels to accumulate in a lot of these different forest types– and mind you, in some forest types, higher elevations, this really isn’t an issue. But in lower elevations, it is. We’re kind of past a threshold now, where it’s very difficult under the way burning conditions are happening now in the summer to just simply let most fires go, because we’re not going to like the outcome. And the ecosystems aren’t going to like the outcome. You’re not going to like the smoke outcome, and you’re not going to like the water outcomes either. And so there are a lot of landscapes where human preparations of the landscapes, to be able to accept safely that kind of fire, is probably pretty important. But there’s a lot of things standing between us and that. One of the biggest issues is that– the real big issue from the fuel standpoint are the small trees, maybe some medium trees, and periodically a large tree, and a lot of brush. And in this country right now, there is not an economy to deal with that stuff. We live in the US. We don’t live in a command economy. And if a profit can’t be made off something, it’s likely not going to happen, absent a huge subsidy from somewhere. So this is one of the big issues with really low fuel prices right now. For example, biomass burning for energy just, right now, is just at a dead end. So that’s a big question, is how do you come up with the extraordinary amounts of funding that is going to be necessary? And then finally– forgive my long-winded answer– but finally, there’s also a big issue with what to do with the material anyway. We’ve lost most of our sawmills in the Western US in the last 20 to 30 years, as the timber industry has died out in many counties. And hence, it’s just not possible to find places to even treat the material. IRA FLATOW: Yeah. Susan tweets, “Please discuss the fire suppressants and the danger of harming waterways.” And I’m reminded of what happens in oil, you know, when you put the dispersants in the water here. She’s talking about fire suppressants going into the water. Jennifer, can you comment on that? JENNIFER BALCH: Yeah, I know that’s a concern. It’s definitely not my area of expertise. But it’s a question of trade-offs, you know, how we fight and suppress fires versus how we preserve water resources. And the water-fire connection is actually even more extreme than that, in the sense that we’re dependent on fire, in some systems, to preserve intact and healthy forests that actually maintain our water systems. So there’s that water-fire connection as well that’s really important. IRA FLATOW: Let’s see if I can get one more question in from Steamboat Springs. Brian, welcome to Science Friday. BRIAN: Hi, Ira. Thanks for having me on. BRIAN: So we do a lot of backpacking and hiking and stuff in Colorado. And I’ve noticed over the last 30 years I’ve lived here less and less maintenance of the forests. And like all your guests have commented on, the sheer number of– amount of wood that’s available when we go camping. We hardly even bring firewood with us anymore, because there’s so much dead wood and dead timber on the ground throughout the northwest part of Colorado. And most of the time, the very little we see the Forest Service out is only to fight fires. We see very little mitigation, or even notice forest rangers on the trails when we hike and camp anymore. IRA FLATOW: Great question. Yeah. JENNIFER BALCH: Yeah. We can’t really address the amount of fuel that’s available and the fire problem with thinning and removing fuels alone. I mean, it’s a huge– that would be a hugely and very, very expensive process. And so fundamentally, we have to be really strategic about where we do treatments of fuels and how we do them. And fundamentally, I think it’s most important where people are living and working, and protecting those areas in terms of reducing and mitigating the potential risk for larger intense and severe wildfires, and then letting fire do the good work that it does when and where we can do it, because ultimately we do live in flammable places. And part of our strategy has to be working with fire. IRA FLATOW: Hugh, how would you answer that question? Is it a question of funding, that there’s not enough funding to do what you think should be done, Forest Service? HUGH SAFFORD: Well, I mean, obviously, funding is something that I have absolutely no control over. And that’s something that Congress is sort of at the root of. And they have their own priorities, and there are a lot of priorities in the country to fund. And so those are sort of big questions to get answered by people in other places. But what you can say, and what is on the public record, is that the proportion of the Forest Service budget that goes to fighting fires sort of in the post-facto sense, after they happen, is now over 50%, whereas a couple decades ago, it was down in sort of the 10%-ish area. And what that means in a challenging budget world is that much more of that pie is being used to deal with emergencies and short-term issues rather than being able to deal with the long-term issues. And this is well-understood within all of the land management agencies, that we have to think about how we allocate funding to be able to deal with these issues. But a lot of it is just the scale of the problem. And again, both Jennifer and Bob referred to this, that there is just so much fuel out there that it’s very difficult to deal with. IRA FLATOW: We’re also a society that works from emergency to emergency. So we’ll leave it at that. Hugh Safford is regional ecologist for the Forest Service’s Southwest Region. He’s based in Vallejo, California. Jennifer Balch, associate professor– assistant professor. I just elevated you, Jennifer. IRA FLATOW: Of geography, and director of the Earth Lab at the University of Colorado in Boulder. Thank you both for taking time to be with us today. Fire historian Steve Pyne says our fire system resembles our health care system—it's focused on emergencies and not prevention. A herd of “elite” brush-clearing goats demonstrate why they are a versatile tool to shield against wildfires in Southern California.